Question: I’m just getting started fly-fishing for bass, but I’m not having very good luck with poppers on the surface. Any advice? Answer: Catching bass on surface flies is a lot of fun, but it’s not as easy as you might think. Bass aren’t like northern pike, almost always willing to chase down a big meal. In fact, bass can be quite picky and will often ignore big, noisy topwater flies. Here are a few steps you can take to improve your odds. Fly choice: Traditional hair bugs and balsa poppers look cool, are fun to fish, and make a lot of commotion on the water. Sometimes, however, all that noise and splashing is too much, especially when the surface of the water is dead calm. In these situations, I much prefer a smaller slider, such as a Sneaky Pete or small Dahlberg Diver, which slips under the water when you strip it. 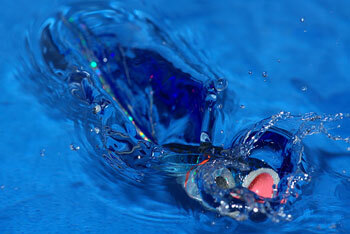 And when I do choose a popper, I usually go counter to the “big fly, big fish” rule and choose smaller patterns. The largest bass I ever caught on a fly was on a Gaines Bass Duster that’s about an inch and a half long. Don’t forget pencil poppers, either. These offer a much less bombastic action, and work great for fishing holes in weedbeds—just cast the fly into the open water and twitch it a few times. Retrieve: A subtle, erratic retrieve will almost always outperform a chug-chug-chug steady strip. The traditional method of fishing a topwater is to chug it two or three times and then let it sit until the rings disappear. You’ll be amazed by how often a fish will strike the fly as it just sits there doing nothing. If you can see a fish under your motionless fly, try giving it just a twitch to suggest life. That’s sometimes all it takes to trigger a strike. Going Big: The times when the big, loud poppers perform best are when you’re fishing deep water—such as on the outer edge of a large weedbed—or when the water is choppy. These are the times when you need to get a fish’s attention in a big way. Experimenting with fly choice and retrieve will surely draw more strikes, and it makes the whole project of bass fishing more interesting and engaging.